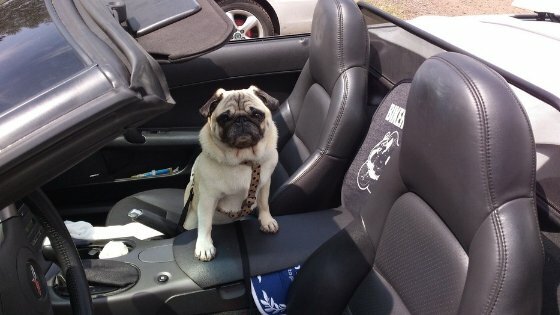 Now that the weather is finally getting nicer and road tripping is on many a mind, it’s the perfect time to talk car accessories for dogs. I have always taken dog car safety pretty seriously, even more so since the day we got a ticket while driving in Spain. We had 3 dogs with us, my sweet girl Red who weighed less than 10lbs and was in her travel bag, our other small dog Jack who was happily resting on my husband’s lap (I was driving) and our foster dog Petra, a bigger dog who was sleeping on the back seat. None of the dogs were visible, but I think it was the ginormous rental car sticker on the back that got the policemen’s attention. We were pulled over and in my few words of Spanish and his 4 words of English, we were told dogs have to be restrained in the car and we got a ticket. Boy was I fuming, especially because my pleadings of ignorance regarding Spanish driving laws fell on deaf ears. That’s the day I went out and bought a seat belt. Even if it’s not a law where you live, or you don’t know whether it is or not, I say get yourself one of the many car restraints for dogs available on the market. I hate to sound like a cliché but…it really is better to be safe than sorry. I’m all about options and love when there’s choice, so here are a few car accessories for dogs to choose from. Can you believe just like babies have car seats, dogs do as well!! If you want something a bit more secure, then a car booster seat for dogs may be the option you’re looking for. They are plush, comfortable and raised off the seat so your dog can still look out the window. Easy to install, they come with a tether that attaches to the dog’s harness to ensure he doesn’t jump out. Most have washable liners and exteriors and some even have a storage compartment for some of your dog’s supplies. There are a couple of barrier styles to consider. One is metal and keeps the dog in the cargo area of a vehicle, the other is mesh and attaches behind the front seats. It blocks off the gap between the driver and passenger seats so your dog can’t climb through. Did you know there was such a thing as car seat belts for dogs!! I don’t know what I expected the first time I saw one, but I don’t think it was an actual seat belt, similar to what you see in every car. The picture above shows Red in her Sherpa bag and Jack with his seat belt, before it was adjusted!! 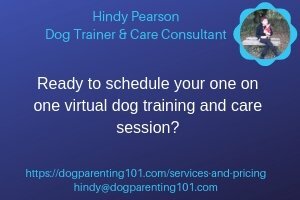 The doggy version is adjustable with a buckle (tongue) on one end that clicks into the bracket on your car’s seat just like the ones for humans. The other end has a clip like the end of a leash that attaches to a harness. Even if your dog doesn’t usually wear a harness, I would put one on him in the car because I don’t like the thought of clipping the belt onto the collar, I feel like it would pull too much and there is potential for injury. 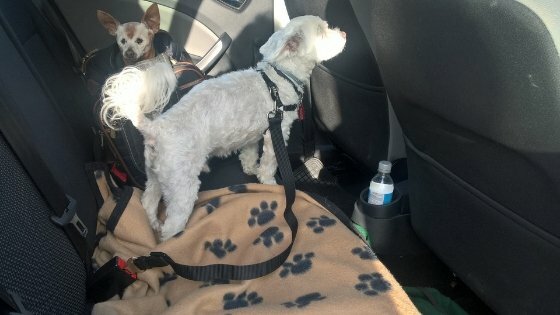 Another way to keep your dog safe in the car is by using a pet carrier, and the one I’ve used for years is the Sherpa bag. I originally bought it because it was airline approved, and I was flying with my cat in the cabin from Toronto to Florida. I used it for Red many times when it was just the two of us in the car. I kept it on the passenger seat with the zipper partially open because it gave her the freedom to stick her head out the top, but she was still safe in the bag. The last item I’m going to mention is a dog crate. Available in wire or plastic models, they come in a variety of sizes so naturally the one you choose will depend on the size of your dog and the size of your car. If your dog will be in the car for several hours, the wire crate is a lot more open so he can see what’s going on and allows for greater air circulation. 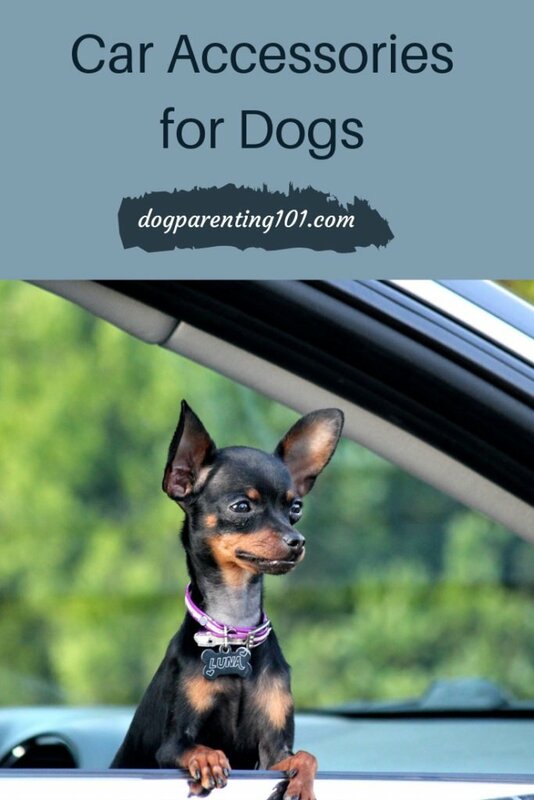 It’s so fun to bring our pups along on our road adventures, but I hope you see how important it is to make safety the number one priority when traveling with dogs in cars. What product do you use to keep you and your pup safe on the road? Have you tried others and if you have, what made you choose the one you’re currently using? Sharing helps others so leave your comment below. My cats always travel in pet carriers when they are in the car. Mine did as well, I believe they are the only safe option for cats.